After a tour and lunch in the only restaurant that was open The “Air du Temps” offered a warm welcome and a hand written menu, a good start. Basically a crepe and galette place. There was also a selection of daily specials. Everything was freshly made and good value. 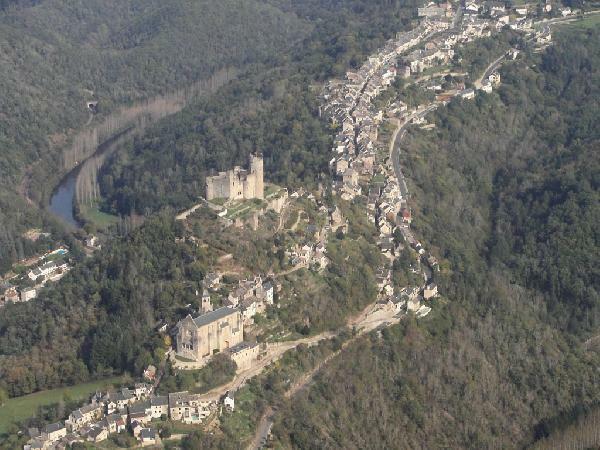 We are lucky enough to have some fine example of bastide towns within easy driving distance, so on a misty morning in February we took our guests on a tour which included the nearest and with a little poetic justice the impressive town of Najac. Spring with a question mark about sums it up. The long, cold and extraordinarily wet winter has become a very wet spring. On odd days it suddenly feels like midsummer with temperatures in the 30s, but we are soon plunged back into the grey and damp, apparently while the UK has record high temperatures……..the irony! It’s not all bad. Everywhere is a lush green and nature is still doing its stuff. Dandelions turn the some fields turn yellow then white, others are white with daisies. The hedgerows are full of birds and flowers. On balance I think I’ll stick with it!